For young hockey players, there is a lot to learn. However, trying to show them everything at once will only overwhelm them and work against learning. Instead, teach them drills to build the basic skills they need to be successful hockey players. Then you can teach more complex concepts. Of course, you have to start with drills made for young hockey players. So, they need to be simplistic enough to be welcoming to new players while still building skill. Here, we will look at drills that will help you put young players on the path to be skilled players. Run these youth hockey drills at your next practice. The first youth hockey drill on our list is simple – tag. This is a drill that, as the name suggests, is based on the game. As such, even your youngest players will recognize it from their days on the playground. This drill is perfect to help your players gain confidence on the ice. The first thing to do is to tell your players to set their sticks aside because this is a drill you want to keep as simple as possible, at least at first. Just like the game, you will choose one player to be “it.” Then, that player will try to tag other players. You can let this game go on as long as you want either stopping them after a period of time or going until the player who is “it” tags everyone else. Versus time bomb is a great and fun drill to help youth hockey players learn how to move the puck quickly as well as how to work together. This drill can also be helpful for improving aggressive forecheck. In this drill, you will split your players into two teams. Each team will go on either side of the red line but both teams should be inside the blue line. The objective for each team is to make a goal. Then, there is, of course, the question of what happens if the puck passes into the neutral zone past the blue line. In this case, the offensive team gets the chance to retrieve the puck. However, you should put a time limit on this as to keep the game going. If the offensive team doesn’t get the puck within this time frame, the defensive team gets the puck. As for the time limit, you can start out by giving the offensive team a little more time and then tighten that time limit as your players improve. When the offensive team is retrieving the puck, the defensive team isn’t allowed to cross the blue line. One puck horseshoe is a great way to develop your players offensive and defensive skills as well as build their confidence. First, you will want to split your players into two line. This way, they will be ready to go for a 1-on-1 drill. The idea of this drill is that the players will try to get a goal and they don’t stop until one of them scores. The only exception to this is that the drill is done when the goalie controls the puck rather than one of the other players scoring. 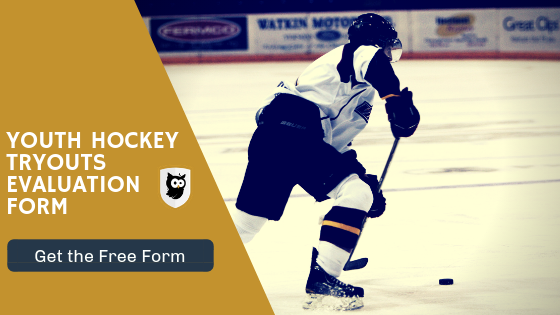 Looking for drills to run during your youth hockey tryouts? We have you covered. Another one of our favorite youth hockey drills is running relay races. The purpose of running relay races is, as expected, to help your players learn how to generate speed. The easiest way to do this is to create 1-on-1 races, and as your players grow in skill, you can pit them against one another in teams. At first, you can build players skill up by simply telling your players to skate from one end of the rink to another. As they grow in skill, you can make the relay races more difficult. This can be done by adding obstacles such as other players or by creating an objective other than to just skate across the ice, such as scoring a goal. Once your young players start to get the hang of the basics, you can hold scrimmages between your players. Scrimmages are smaller than an official hockey game, so you can hold them within your team – you don’t need another full team to achieve the effect. All you have to do is split your players up as easily as possible and put on a mock hockey game. This is important for a couple reasons. For one, it gives these players a chance to put together the skills they’ve been working with the above drills. Other than that, though, this is a chance for them to juxtapose those skills with the actual workings and rules of an actual match. They get to put the concepts together with the bigger picture. In addition to building skill, scrimmages are also a way for youth players to have fun while focusing on teamwork. About the author: Steven Sanders is a writer, blogger, and fitness enthusiast with a particular love of hockey. He writes at Honest Hockey. If you want to talk health, fitness, or self-improvement, don’t hesitate to get in touch.